To-do lists. Summer activities, recipes,arts & crafts, places to go, housework. It's getting ridiculous. Not an awful lot. Curry, chips and pasta. I have a fairly exciting meal plan next week - spinach and ricotta pasta, fish tacos and pesto chicken - but this week has been pretty easy and lazy. Diet Coke, fruit tea, lattes & fruit infused water. A variety is helping me drink more, I think. Eating: Out at a fancy restaurant tonight. The menu was in French & the wine was expensive, but the atmosphere and company was good. A double date with my in-laws, where we talked about Colin as a kiddo and weddings. Playing: Softball, twice this week (I even hit the ball!! More than once!! ), cars and with water. Drawing: Our family, upon request. Sadly, stick men are about as artistic as I get these days. A decent sleeping patten for our household. If it's not one boy waking me up in the middle of the night, it's the other. After a few late nights last weekend, the boys are fighting sleep until ridiculously late. Coupled with me missing a few bedtimes this week, and an assortment of naps for everyone involved, our mornings seem to be getting earlier and earlier. I KNOW Joshua needs more sleep than he's getting, with 6:45am starts, why won't he just give in?! Wearing: All the stripes. Always. Forward to my birthday, in 11 days. We have plans for a picnic, a family softball game, and a beach trip. Time pretend online shopping. 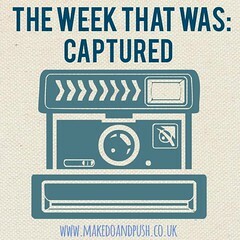 I have barely blogged this week, and I don't even have a good excuse. I just keep getting wrapped up in pretend shopping, one of my favourite pastimes. Being outside as much as possible. We have been in the sand pit, the paddling pool, to the park, to the big pool at the pavilion, and spending nearly every waking hour in the garden. We plan on doing the same this week, squeezing a visit to the ducks and a picnic in too. Running with a partner. Colin & I went for a run together earlier and I'm so surprised at how far we went. Not particularly far, granted, but I ran for the longest I have for a long time. It was nice to do something different together, we're thinking about doing an exercise challenge together (I totally failed at mine!) so we can keep each other motivated. Loving: Iced drinks and ice lollies on hot days. To eat healthier this week. I've ordered a ton of fruit with the shopping so I'm hoping to curb my bad snacking habits. At how fantastic my boys' selfie poses are. Teaching: Daniel to read. This is such an exciting and terrifying milestone, I am so so proud of him but on the other hand my heart is breaking at how grown up he is. He has his transfer day for 'big school' this week, and I'm not sure I will be able to cope. I am sure he, on the other hand, will be fine, if a little tired out. I hear you on the sleep... Why do they want to stay awake so late and wake up so early? Why do they not understand how wonderful sleep is yet? ;) Lovely photos!